There lived a man called Peleus. He was a master wrestler. 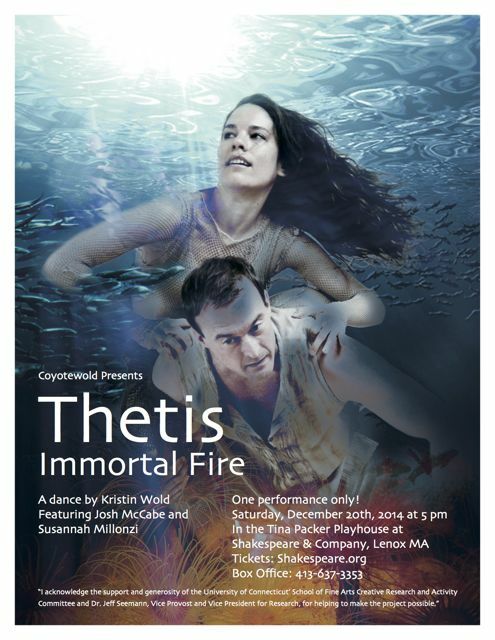 (LENOX, MA)—Kristin Wold presents Thetis: Immortal Fire in the Tina Packer Playhouse at Shakespeare & Company on Saturday, December 20th at 5pm. One performance only. A dance theatre performance inspired by the story of Thetis, the sea nymph of Greek mythology who was a shape-shifter and mother of the great warrior Achilles. Thetis tries to immortalize the baby Achilles by burning him in the hall fire by night and anointing him with ambrosia by day. In another version of the story, she tries to protect him by dipping him in the River Styx in Hades. His heel, untouched by the water, was not protected and became his mortal weakness. The performance features Susannah Millonzi as the sea-goddess Thetis, and Josh McCabe as Peleus, the mortal father of Achilles. One performance only. Saturday, December 20th at 5pm in the Tina Packer Playhouse at Shakespeare & Company, 70 Kemble Street, Lenox, MA. $20 adults/$10 students. Tickets can be purchased in person or by phone at the Shakespeare & Company Box Office at (413) 637-3353. Tickets are also available at https://tickets.shakespeare.org with a per ticket charge of $4.50 for online purchases. Kristin Wold was most recently seen acting in Shakespeare & Company’s critically acclaimed shows, Shakespeare’s Will and Julius Caesar last summer. In the one-woman show Shakespeare’s Will, directed by Daniela Varon, she played Anne Hathaway, Shakespeare’s enigmatic wife. In Julius Caesar, the ‘bare Bard’ production directed by Tina Packer, she played Portia, Calpurnia, Lucius, Metellus Cimber and Pindarus. “Thetis is a project which takes me into new artistic territory as a creator, choreographer and director,” says Wold. “Most of my work has been as an actor in brilliantly written plays – most of those by William Shakespeare. With this project, the members of the company and I are creating a world of pure movement. Thetis is fascinating to me. She is sea goddess, a shape-shifter, an immortal. Zeus and Poseidon both want her, but it is prophesied that her son will be greater than his father, so they marry her off to a mortal man, Peleus. Her wrath at being taken down or humanized, eventually transforms into love and a passion to protect her son, Achilles. Exploring the tension between divinity and humanity, between order and chaos is my focus. I am amazed at the brutality we humans inflict on ourselves and each other. I am even more amazed at our extraordinary kindness and ability to love. I sometimes think that if we, as a species, could see the bigger picture – could see our planet in the midst of its galaxy in the midst of the universe, maybe we would stop killing each other. A long-time resident of the Berkshires, Wold played Ariel in two Shakespeare & Company productions of The Tempest, first with Michael Hammond as Prospero in 2001 and again with Olympia Dukakis as Prospera in 2012. In King Lear she was Regan opposite Dennis Krausnick in 2012 and Cordelia opposite Jonathan Epstein in 2003. Other performances with Shakespeare & Company include The Memory of Water (Teresa), Sea Marks (Timothea), Othello (Emilia), Ice Glen (Sarah), Twelfth Night (Viola), Measure for Measure (Isabella), Romeo and Juliet (Juliet), Berkeley Square (Helen). Acting roles with Connecticut Repertory Theatre include All in the Timing (Dawn, Edna), Lovers and Executioners (Julie) and Arcadia (Hannah). Wold’s directing credits include Punk Rock, The Last Days of Judas Iscariot, Abraham Lincoln’s Big Gay Dance Party, Thin Air: Tales from a Revolution, Judevine, Brutality of Fact and Loose Knit (Connecticut Repertory Theatre) and Indian Blood (Mixed Company in Great Barrington, MA). She teaches acting and movement for Shakespeare & Company’s professional actor training programs and in the BFA and MFA Acting programs at the University of Connecticut. Wold studied acting at Burt Reynolds Jupiter Theatre, Florida State University and with Tadashi Suzuki in Japan. Costume design is by Maureen Freedman. Lighting and Projection Design is by Erika Johnson. Original Music Composition and Sound Design is by Alexander Sovronsky. The cast includes actors from Shakespeare & Company and from the University of Connecticut Dramatic Arts Department. Kristin Wold, director and creator of the dance, has worked as an actor with Shakespeare & Company since 1987 and has been on the faculty at UConn since 1999. The dance offers a unique opportunity for young artists and professionals to collaborate in creating a new performance piece. THE UNIVERSITY OF CONNECTICUT SCHOOL OF FINE ARTS DEAN’S RESEARCH GRANT supports research and creative activity of superior artistic and scholarly merit within the School, especially projects in their initial stages that are likely to result in high-profile performances and that have strong potential to attract external funding from such agencies as the National Endowment for the Arts, the National Endowment for the Humanities, the Connecticut Commission on the Arts, and other regional, national, and international bodies. This project is made possible through the support and generosity of the University of Connecticut’s School of Fine Arts Creative Research and Activity Committee and Dr. Jeff Seemann, Vice Provost and Vice President for Research.